In case you don't know, Stephanie Barnard dies are some of the best solutions you will find for making cards. Whether you love cutting and embossing with Framelits, Movers & Shapers Flip-its, Embosslits, or Textured Impressions, the creative mind of Stephanie Barnard has contributed so much to our Sizzix library of designs. No matter what you are looking for, if we have it, it's probably the best price you will find anywhere online. 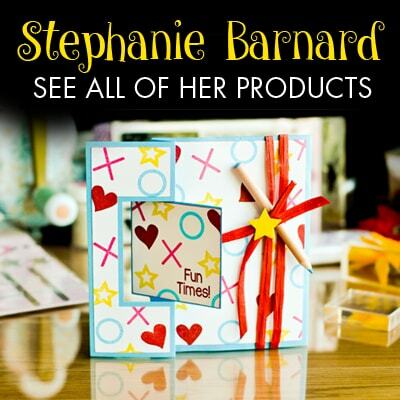 We love Stephanie Barnard Sizzix dies, and we encourage our customers to explore the creativity she inspires. Stephanie makes creative designs, for example the Flip-its dies offer very unique stylings to card-makers. It's so easy to cut these fabulous designs, all you need is a compatible machine, two cutting pads, and then pick out your favorite material. You make a sandwich out of the material, dies and pads and then pass them through your machine for precise cutting. You can make endless amounts of original art with just one die set by changing the material and how you decorate it. Drop-ins are a Stephanie Barnard original, and this a solution for embellishing paper projects, like none other! Come to think of it, Stephanie Barnard stamps may be what she is most known for. Using the Stamper's Secret Weapon accessory and an acrylic block, you can get creative with a variety of her clear stamp sets, you can make wonderfully precise stamped designs on all your favorite paper projects. Stephanie lives with her family in southern California and she self-identifies as a stamper and that is where her true passion is found (and it's easy to see when you take a look at the Framelits w/ Stamps sets). Stephanie has been in the industry since 1998 and has done everything, from magazine editing to QVC demonstrator. Stephanie is an animal-lover, and that's just one of the many things we find adorable about her!